Click here for our post on Election Day Information – Polling Place Locator, Voting Guides and Election Day Discounts. For the most part – IheartPGH has been a non partisan blog about Pittsburgh. But the truth is that this entire blog started with a couple of conversations between Natalia Rudiak and I, when we met 8 years ago volunteering on Bill Peduto’s first campaign for mayor in 2005. After seeing that some of the voters who follow IheartPGH on Twitter are still undecided about who would be the best mayor for the city of Pittsburgh – I wanted to share some thoughts on why this mayoral election is important why I think Pittsburgh needs Bill Peduto. A few weeks ago the Post-Gazette published this article by columnist Sally Kalson “Pittsburgh Doing All Right: At least we’re not the most corrupt city, and we have topped some cool lists.” The title of this article really struck me – why is “all right” okay with this city. Why are we ok with some corruptuion. And why can’t Pittsburgh be the best city for everyone. Why are we okay with Pittsburgh being just okay. 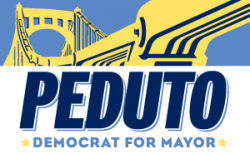 Today – you have a chance to help Pittsburgh do a whole lot better by voting for Bill Peduto. There are probably hundreds of reasons why I think Bill Peduto is the best choice for Pittsburgh today which I have tried to simplify to 2 main points – people and sharing ideas. People First – So the thing that makes Pittsburgh, Pittsburgh – you know this place that people are so in love with that they ready a blog like IheartPGH, it is more than the steelers and more than pierogis, it is people. One of the conversations that led to Natalia and I starting this blog was the need to share stories of the small businesses in Pittsburgh, the places that are owned by Pittsburgh people. In 2005, there was a lot of talk about what Pittsburgh needs to attract young people. Many of the leaders were talking about more big development, more Starbucks, and places like Dave and Busters. P But no one was talking about the folks that were moving to Pittsburgh for the local places. Many Pittsburgh leaders have been rolling out the red carpet to attract outside business. No one was talking about the Pretzel Shop or Grocery Italiana in Pittsburgh. Since I first met Bill Peduto – he has focused on the people. Not only is Peduto passionate about supporting local businesses but he understands how important it is that we create government policies that are just as friendly to the Pittsburgh businesses as they are to the big businesses. Bringing Ideas to the table – While Pittsburgh may be unique in terms of the love that residents have for this city, Pittsburgh is not unique in some of the challenges we face trying to figure out how to adjust to a changing economy. I have been fortunate to attend some of the GLUE (Great Lakes Urban Exchange) Conferences. GLUE is an organization that was founded by a Pittsburgher and a Detroit resident with the idea that rustbelt cities need to do a better job of sharing best practices. There is a huge opportunity to learn from, collaborate and improve on ideas that have been tried in other cities. One of the reasons I love blogging is that it is an incredible way to share ideas. Every week on this blog and on the IheartPGH Facebook page and Twitter accounts – the IheartPGH community shares ideas. Bill Peduto has gone out of his way to spend time studying Pittsburgh and other cities and to find new ideas and more importantly new solutions for some of the problems facing Pittsburgh. Not only has Peduto gone out of his way to seek out ideas – but he is always happy to learn about other ideas. A few years ago I read this article in Fast Company – The Starbucks Cup Dilemma. Which details how Starbucks is trying to reduce cups thrown into the trash. The article also talks about how Seattle’s mandatory composting program has reduced the amount of waste going into a landfill and saved the city of Seattle a significant amount of money. After reading the article I ran into Bill Peduto and I immediately started asking what it would take to set up something similar in Pittsburgh. Peduto was more than happy to stop to talk about composting (or any of the other ideas I have stopped him to talk about) and knew about similar programs in other cities.